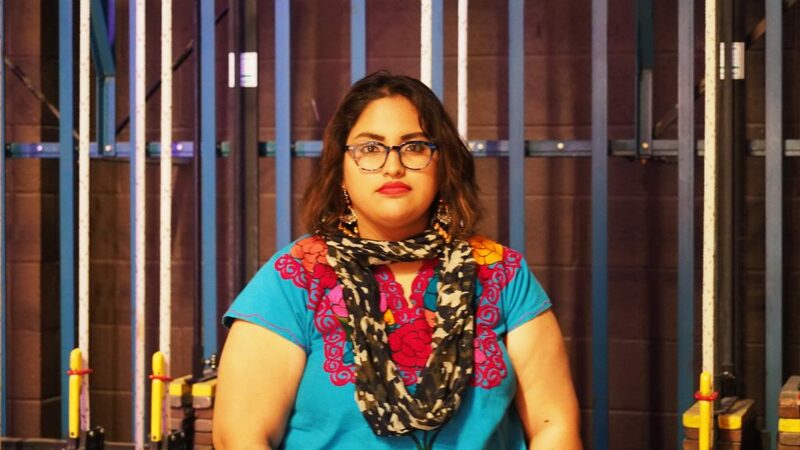 “I was wearing the same jeans and shirt for an entire week,” Wendy Acosta, a Brookhaven College student, said. Acosta and her family were forcefully evacuated from their house Feb. 24, without being given a date to return. Atmos Energy workers took over thousands of Northwest Dallas homes to fix gas pipelines in the area. Arriving at her street on Larga Drive, a swarm of police cars and officers surrounded the entire block. Startled and confused, Jesus Acosta, Wendy’s father, informed Bertha and Betty Acosta, Wendy’s mother and sister, respectively, about the explosion that occurred on Espanola Drive, killing a 12-year-old girl. They were evacuated and could not go back home. Jesus was the only one home at the time of the explosion. He opened the door to find police officers waiting outside his doorstep. The officers went door to door to evacuate homes. Wendy’s family was one of 2,800 others displaced, according to NBC. Wendy and her mom managed to get inside to grab as many personal belongings as they could. “I snuck into my house when the cop was distracted,” Wendy said. She grabbed her medication and important documents. Trying to focus on what she needed, she almost forgot to grab their 7-month-old Yorkie poodle, Coco. Police officers and the Dallas Fire Department told the family and neighbors no one was allowed in the area. “We are lucky because we can speak English and Spanish, but a majority of my neighborhood only speaks Spanish,” Wendy said. She said Spanish speaking families did not have people to translate instructions for help. 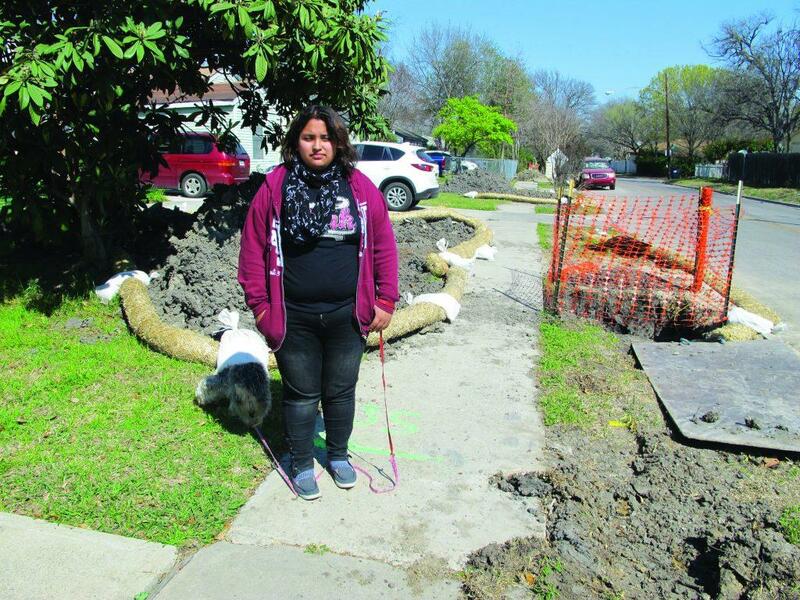 Photo by Natalie Davila | Wendy Acosta, a student affected by the Northwest Dallas gas outage, stands in front of her home. Wendy was not happy Atmos did not initially provide compensation for families. Her family received information on where to stay from a police officer. Atmos Energy eventually paid for families to stay at hotels. Wendy said the hotel was inconvenient for her family. It was far from work and school. Sharing one room between four people at the DoubleTree did not leave much space for privacy and caused frustration. Few people from school knew about her situation. Among those few were her castmates. “The play was the best distraction for me,” Wendy said. While school and the play kept her temporarily distracted, Wendy said she struggled to complete her homework. Their hotel room was too crowded. Rehearsals took much of her time. Wendy said she saw a change in her artwork. Darker colors and more blues replaced the vibrant colors she normally used. On March 5, the Wendy family was told by Atmos they could finally go home. Although they were happy, they did not feel safe. “When we got to go back home, you could smell gas in the air,” Wendy said. “We did not cook the first two days,” Wendy said. Her mom and sister had a harder time feeling safe at home. When they returned, most of the sidewalk in front of Wendy’s house had been removed. Wendy said a thick-leaved tree given to them by Wendy’s grandmother was still there. They constantly check on it to make sure it is not harmed. Wendy said it may take time to get things back to normal again, but her family is slowly starting to feel more confident and secure in their own home.